1979 - Merger of the RCIU and AMCBW creates the United Food and Commercial Workers International Union (UFCW). William H. Wynn elected International President, and Romeo Mathieu and Clifford R. Evans elected leaders of the Canadian membership, as directors of Regions 18 and 19 respectively. 1980 - Barbers, Beauticians and Allied Industries merges with UFCW. 1980 - First UFCW Women’s Affairs, Civil Rights and Political Action Conference is held in Washington, D.C., and the UFCW Women’s Network is launched. 1981 - UFCW begins national safety and health programs to identify job hazards and create training. 1983 - UFCW’s first regular convention is held in Montreal, Quebec, Canada. 1983 - The Insurance Workers International Union (IWIU) votes to merge with the UFCW. 1983 - UFCW begins its affiliation with the Leukemia & Lymphoma Society. 1983 - After 25 years with predecessor Unions – UPWA and AMCBW – former UFCW Vice President Charles Hayes becomes the first trade unionist ever to be elected to Congress, and serves five terms in the U.S. House of Representatives (Illinois). 1983 - Ricardo Icaza becomes first Latino elected UFCW Vice President. 1986 - Canadian Union of United Brewery, Flour, Cereal, Soft Drink and Distillery Workers mergers with the UFCW. 1986 - UFCW members at Gainer's meatpackers in Edmonton are forced on strike after the compands demands heavy concessions, sparking the “Battle on 66th Street” and one of the most tumultuous strikes in Canadian history. 1986 - Creation of the UFCW Canada National Defence Fund (NDF), which would eventually become the country’s leading strike and lockout resource. 1987 - Due to UFCW pressure, OSHA expands hazard communication standard to provide information and training to hair care and retail workers. 1987 - Huguette Plamondon elected UFCW Vice-President. 1987 - United Hispanics founded: now known as United Latinos of the UFCW. 1987 - Lenore Miller, President of the RWDSU, becomes the first woman union president elected to the AFL-CIO Executive Council. 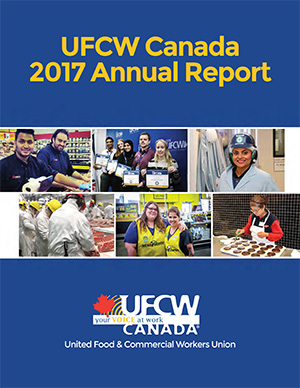 1988 - Creation of the UFCW Canada National Council, and UFCW Canadian regions consolidate under the name “UFCW Canada,” with Clifford R. Evans serving as the union’s first Canadian Director. 1988 - UFCW, Iowa Beef Processors and OSHA sign safety and health agreement with three-year program to reduce trauma injuries for packinghouse workers. 1991 - Independent Foodhandlers and Warehouse Employees Union (IFWE) affiliates with UFCW and becomes Local 791 (Massachusetts and Rhode Island). 1992 - Local 1, Leather Goods, Plastics, Handbags and Novelty Workers Union merges with the UFCW. 1992 - Tom Kukovica voted UFCW Canadian Director. 1993 - International Union of Life Insurance Agents (IULIA) of Ohio, Wisconsin and Minnesota merges with the UFCW. 1993 - RWDSU merges with the UFCW and becomes RWDSU District Council of the UFCW. 1994 - Douglas H. Dority elected UFCW International President. 1994 - United Garment Workers of America (UGWA) merges with the UFCW. 1995 - Textile Workers of America (UTWA) merges with the UFCW to become UFCW Textile and Garment Council. 1995 - Distillery, Wine and Allied Workers International Union merges with the UFCW to become the UFCW’s Distillery, Wine and Allied Workers Division. 1995 - UFCW’s Food Processing, Packing and Manufacturing Division establishes a Diversity Task Force aimed at addressing immigrant workers’ concerns within the packing industry. 1996 - International Chemical Workers Union merges with the UFCW and becomes the International Chemical Workers Union Council of the UFCW. 1997 - Canadian Union of Restaurant and Related Employees merge with the UFCW. 1997 - Mary Finger, UFCW Women’s Network Chair, elected Vice President and is named Director of UFCW’s Civil Rights and Community Relations Department. 1998 - Sarah Palmer Amos elected first woman UFCW Executive Vice President. 1998 - Production Service and Sales District Council merges with the UFCW. 1998 - UFCW members march on Walmart headquarters at Bentonville, Arkansas. 1999 - Textile Processors, Service Trades, Health Care, Professional and Technical Employees International Union merges with the UFCW. 1999 - UFCW Canada wins a Supreme Court of Canada decision for unions to communicate freely with the public about their disputes, including workplace locations where there is no union.